Also, check the laptop with external display to isolate the cause of the issue. I appreciate the time and effort that you took to troubleshoot the issue. Please let us know if the issue occurs on a external display as well. The issue does not occur on the external display. It only occurs on the laptop screen. I appreciate the time and effort that you took to troubleshoot the issue. LCD of the system would require replacement. If the system is under warranty then please contact me through a private message by clicking on my name highlighted in blue. On the next page, click the envelope icon and provide your service tag and contact information so I may access your system records. I have the same problem occurring in the same location, but only intermittently so far. What have you learned about a fix? I haven't learned anything about it so far. The Dell guys on the forums haven't given me any actual helpful info yet. For me the problem was on-and-off at first but my guess is your "shadow" will be the same as mine and keep reappearing at a more and more consistent rate until it eventually will just always be there from the moment you turn on the laptop to the time you shut it off. If you learn anything please let me know! 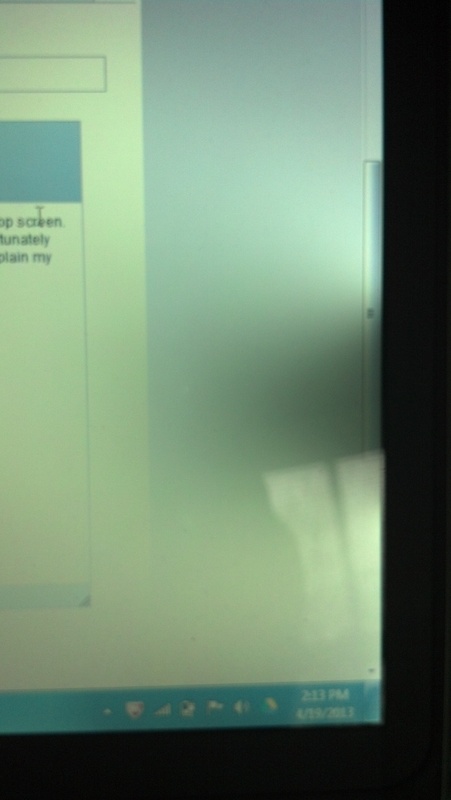 This looks like damage to the screen or the reflector behind it - one way or another, the screen needs to be replaced. You can isolate the issue by connected the system to a external monitor and let us know the results.